Upstate4x4.com / The Garage / Working On My Ride & Need Help Or Advice. I am thinking about buying a burban or tahoe and was wondering what years I might want to stay away, or common failures to look for, etc. Directed mostly towards smithy, but I believe there are others on the site that may know a bit about suburbans as well. NC has weighted tag tax for TRUCKS only. SUVS are not included in this which makes them great tow vehicles while getting around paying hefty yearly weight taxes. Also, having a suburban or tahoe would actually make for a great trip vehicle due to all of the enclosed room inside. I have also been looking into the GMC side, but they seem a bit more expensive. What to look for all depends on what year you are looking at. Are you after a square body, a 400 series (like mine), 800 series (like AA1PR), 900 series (07 and up)? Each has its own quirks. In general a 454 or 8.1, 4L80, 14 bolt combo can handle a multi car trailer or large camper but any of them will haul the Zuk with ease. What about the blue oval? Excursions are awesome. I am not against a big block if I could find one for cheap in good condition, which is actually a possibility since people are staying away from gas guzzlers.. and having a gas guzzling vehicle that is NOT a truck doesn't make much sense (unless camper hauling, but honestly people have gone towards diesels more than anything now a days). But, personally, for a 3500# vehicle on a trailer that will weigh 1000# or less... I think a 5.7 would be plenty for towing and best for fuel mileage.. I have been looking at mostly 1990s... but I know the trans has always been an issue for these vehicles. New vehicles, 2000 or so, are a bit of out my price range. And I am not running anything with a carb, so late 80s is out of the question. I am not opposed to diesel, 6.2? 6.5? Not sure what was offered, nor what their weak spots are. Id like to keep it simple, and a tbi 5.7 is about the easiest thing to me. But again, the 8.1 is stout all the way thru which I do like... shouldnt have to worry about drivetrain issues... its just the fuel that could break me. Didnt they make a 7.4 or something as well? A 90's model half ton would be perfect. Like you said the 5.7 is good on gas and there isnt a whole lot that goes wrong with them. Well maybe intake gaskets and injectors, but that's an easy afternoon fix in the driveway. The 4L60 trans had some solenoid/valve body issues. And the reaction shell fracturing problem. Most of them have been upgraded by this point. Other issues: stupid plastic door handles that break easily, leaf springs break at the eye, windshield wipers that wont shut off. At least you wont have the rust and corrosion issues to deal with. On good thing is parts are cheap and readily available. Any salvage yard is full of them. The 6.5 is a funny animal, honestly I would stay away from it. Although you can find them cheap, (or free from a frustrated owner) Its the only reason I have mine, the engine would randomly go full throttle for no reason, or stall for no reason. The previous owner was afraid to drive it anywhere. I hear the original owner had the same issue. It still isnt quite right. The 7.4 is a fuel injected 454, different intake and heads. Fold the seats flat and a suburban will hold a 4x8 sheet of plywood, or 12' boxes of siding with them resting on the dash. All with the rear doors shut. Kayaks fit nicely on the roof, and a fullsize mattress fits inside if you need a weekend away. If you are creative they will haul almost anything a pickup truck will. I owned a 1997 Tahoe for a couple years. Was an awesome cruiser, took it on several trips. I paid $3,200 (Seller wanted $3,500) about 8 years ago for it in Geneva, NY. The only issues i had with this rig were the converters became plugged at 210K miles, and I also needed to do Ball joints at 190K miles. This rig would get about 13 MPG on country roads unloaded. This would definitely be enough for the towing you would do. However the Burb would have much more room inside and could be had in a 3/4 Ton. 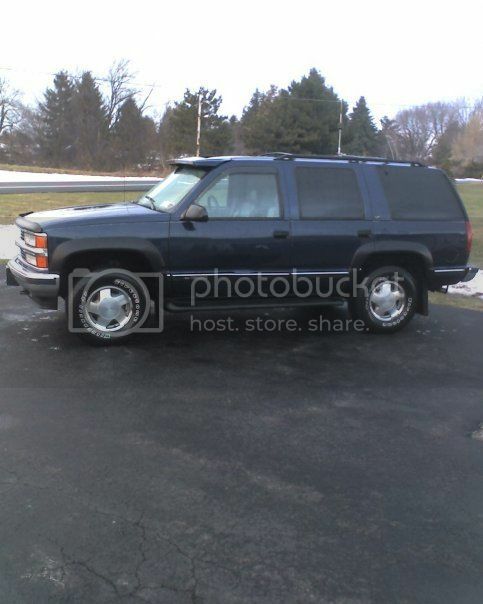 Id get a 96 or newer to get the Vortec 5.7L. You will have to deal with emissions on the 1/2 ton, but not 3/4. I fully support the ownership of suburbans. And yes my wipers do what they want. It rattles so bad I cannot hear the radio. But the 5 speed conversion keeps away the auto trans issues. My 454 gets a great 11 mpg. But with an Excursion you can drive around with pride knowing that you have the vehicle that the Sierra club used to set on fire in parking lots to save the environment! Well, just bought a '99 burban. Actually coming from NY believe it or not. Told myself I wouldn't by any more northern vehicles, but it couldn't pass it up. My father plans on driving it down next time he visits, which should be soon since my sister is only a week away from giving birth to her daughter. I think I will be happy with the roomy burban. I was always a truck guy, but I see the 100000 benefits from having a enclosed work horse. Plus, when it comes to bumper pull trailers, no need to have a bed really anyway. Its a LT 5.7 SFI. And, all of this means... I am coming to NY this year for the annual get together, wheeler and all. It will be great seeing you guys again!!! Great to hear, looking forward to the build!